At the present time, as we observe the collapse of the structures and natural disasters such as the extreme climate conditions and human disturbances around the world, I recall Robert St John saying in the 1990’s that it will be imperative to be creative leading up to 2020. This is necessary to avoid the collapse of the mind and diseases of the body. Unconscious stress/blocks are the the source of all disturbances in human life. Disturbance is manifested in disease and negative behaviour. The most intense disturbances are expressed in compulsive physical and sexual violence, murders, wars etc. Metamorphosis releases unconscious stress and effects fundamental creative change. There has been an obvious shift in Consciousness over many decades and immensely evident since 2012. From the Metamorphosis point of view Afference is now in a position of authority activating the flow of consciousness. Efference in its failure to respond is reacting and ceasing to retain its control and power. Until Efference moves into response it will be a daily moment by moment challenge to be creative. Treatment of the head and sinuses creates true stability of mind and an ability to be a creative thinker. An independence of mind is awakened with Metamorphosis, free of the control of the structures. The chaos of the past is brought to the surface to be morphed. The head is the illumination of consciousness through the pineal and pituitary and the sinuses communicate that light of life. The sinuses are rooms of particular attitudes of minds which have an association with the senses. The Sphenoidal Sinus - the only single sinus, it is the central sinus which has communication with all the other sinuses. The Frontal Sinuses - are located above the eyebrows and have an association with the sense of sight. 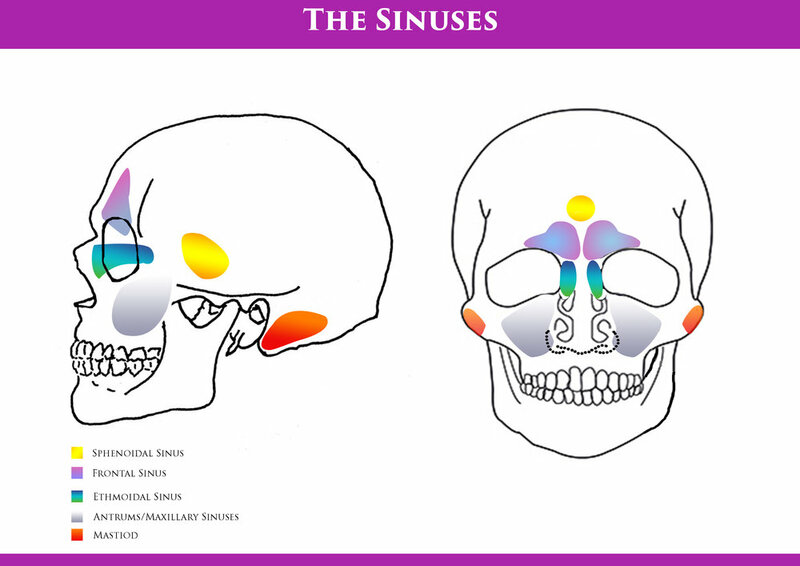 The Ethmoidal Sinuses - are located between the nose and the eyes and have an association with the sense of smell. The Antrums/Maxillary Sinuses - are located on either side of the nose and have an association with the sense of taste. The Mastoid sinuses - are located behind the ears and have an association with the sense of hearing. Attention to the head and sinuses in treatment illuminates creative communication in the mind. The more we release blocks (morph) the more this communication illuminates through the body to activate spontaneous creative function - Afference creating Efference in the moment, (The Creation Theme). I have many examples of people with sleep problems who were successful with Meta but one woman stands out. She had been diagnosed with insomnia about a year before she made a Meta appointment, having difficulty getting to sleep and waking up many times at night. She had given up coffee, started yoga, tried many remedies and had finally resorted to prescribed sleeping tablets months before she heard of Metamorphosis from a friend. When all failed and in desperation, she arrived for her introduction to Meta informing me of her chronic sleep deprivation. Following her anxious and restless nights she suffered daytime fatigue, irritability with her family, inability to work and spent undue time worrying about sleeping. At the first treatment the woman was sceptical and was relieved to know that Metamorphosis did not require belief. She was responsive to the treatment and willing to learn the Hand Symbols. I recommended she do them often especially in bed. She returned the following week with more enthusiasm informing me that her sleep remained poor but was more relaxed in bed doing her Hand Symbols and had more daytime energy. Following a few more treatments, she was reducing her sleeping tablets and was open to learn how to do the treatment for herself. She introduced Meta to her family who were interested because she had become less irritable, - the positive ripple effect of Metamorphosis. When the block is erased the symptoms and their memory cease to exist. It is important to remember that Metamorphosis is a way of life that allows the individual to take responsibility for the sleep disturbance (block). The Hand Symbols are a positive habit to do any time of the day or night and before rising in the morning. You give yourself the opportunity to drift into sleep in the moment, not allowing stress or anxiety (conscious or unconscious) to disturb your night, ensuring you have a restful sleep to wake up with a positive attitude. A woman I treated regularly about 7 years ago attended my practice recently. She had continued to practise Metamorphosis but due to considerable challenges in her life at present, she decided to seek the support of a catalyst again. We both recalled the success she created with Meta in the past, when we discussed the time we first met. The woman suffered chronic back pain and was scheduled to undergo back surgery in the hospital where she worked. She was very resistant to surgery but as she had suffered constant pain and missed so much work time, she decided to go ahead with it. She was also suffering from the side effects of analgesic medication. Her open mind and enthusiasm to self heal was ideal for Metamorphosis success! On the months leading up to her surgery date she noticed she needed less pain relief as her back pain eased. Her work attendance improved and she was enjoying a better quality of life. The day before her surgery she arrived for a Meta treatment prior to her hospital admission. She was very hesitant about undergoing surgery due to her progress. However, she had doubts about maintaining her balance *(Afference and Efference) and that if her back problem returned, the hospital might not be sympathetic if she was absent from work again. As she left me that day, I encouraged her to do her Hand Symbols to enable her to make a creative decision. Later on that evening, I got a telephone call from the woman in an delighted state. She informed me that following her admission to hospital she was sitting up in bed, calm and relaxed doing her Hand Symbols, when her surgeon peeped in the door of her room and observed her serenity. He enquired about her back pain and mobility and following a check up, he discharged her. The woman’s attitude had changed and her Consultant advised her to keep up whatever she was doing. He often met her in the hospital corridors during her working day, commenting on how well she was doing. Her back remains symptom free to this day, so much so, that she had forgotten she had a back problem. Recalling her past success with Metamorphosis gave her the impetus to get on with morphing her latest challenge. Remember, Meta is a creative way of life that in practice, identifies and erases the block or the source of the symptom. A symptom is a manifestation of a block/Unconscious stress. Surgery is to do with the symptom, Metamorphosis is to do with the source. Abuse whether it is verbal, physical or sexual, creates a disturbing memory in the lives of those who suffer it, inhibiting their creativity in life. In my experience of being a catalyst for abused people over the years, I have seen many people erase the memory of their disturbed past. Robert St john used to say, “the disturbed memories of life are minor to the disturbances of the gestation period, the trouble in gestation is minor to the disturbance registered at conception but, the unconscious negative pre-conception stress (beginning of time) is major source of trouble (block) in our lives.” It is the source of repeated disturbed patterns through time. The woman is now in her early 40’s, beginning to live a life of freedom from the effect of her childhood and life in general. Metamorphosis gave the woman the opportunity to address the block or true source of her troubles. She no longer identifies with the pattern and is more at ease and creative. She hopes her story will help others to create permanent freedom from repeated disturbed patterns with Meta.